Um. So, between some excellent sales (particularly from Samhain as they wind up), some raids on the library in preparation for Contact and my trip to the Contact dealers room, I might have been a bit excitable with my acquisitions. Even keeping up my excellent reading rate hasn’t helped. But I always knew March was going to bring in a lot of books. Unsurprisingly, my #ReadMyOwnDamnBooks stats have taken a dive. My goal for the challenge was to make sure 60% of the books I read this year come from Mt TBR. At the moment, it’s at 40%, so I have a fair bit of work to do and will be concentrating on that in the coming month. Books with an asterisk on the list below were part of my #ReadMyOwnDamnBooks effort. 22. The Lyre Thief by Jennifer Fallon. Reviewed here. 23. Falling in Love with Hominids by Nalo Hopkinson. Reviewed here. 24. Jackdaw by KJ Charles *. Another story set in the world of A Charm of Magpies. Jonah is a windwalker and a thief who got tangled up with the wrong crowd. When he betrays Ben–his lover and a police officer–Ben comes looking for revenge. Charles does a great job of capturing the desperation of their situation and how poverty in particular almost swallows them both. 25. Blood of Innocents by Mitchell Hogan. Reviewed forthcoming. 26. Think of England by KJ Charles *. A historical m/m romance set in 1904. Quite a different feel to Charles’ A Charm of Magpies series. Archie Curtis was injured in a military accident and seeks to discover whether it was actually sabotage. I liked that Archie didn’t start out with the awareness that he was gay, but that it was something he ended up discovering about himself. 27. The Dreaming by Queenie Chan. Creepy gothic manga set in Australia. Twin girls get shipped off to stay with their aunt at a remote boarding school, where strange disappearances are becoming too commonplace. I probably shouldn’t have read this one after dark. 28. Jonathan Strange or the Evidence of Ghosts by A.K Benedict. Review forthcoming. 29. Arkanae by Lynette Noni. A young girl steps through a portal into another world where she ends up attending an academy for students with special abilities. An enjoyable story but read like Harry Potter with the serial numbers filed off. 30. Foxglove Summer by Ben Aaronovitch. The fifth in the Peter Grant/Rivers of London series. Peter takes a much-needed break from London to help search for two young girls abducted in the country. Includes fae done right. Wingborn Ch 1-3 by Becca Lusher. Membership to the Rift Riders is open to women for the first time in over a century and Lady Mhysra Kilpapan isn’t going to let anything stop her from enrolling. Especially since she is Wingborn and thus already bonded to a giant, grumpy eagle called Cumulo. Well-paced fantasy with snappy dialogue and interesting world-building. But I may be biased, having read previous drafts. You are terrible for my own tbr but I just love stalking everyone’s tbr! 🙂 I need to look them all up on godreads. The Dreaming sounds really good and I should start reading manga methinks. Also love the sound of Cranky Ladies! 🙂 Happy reading in April! If you pick up any of the books, I’d love to hear what you think. 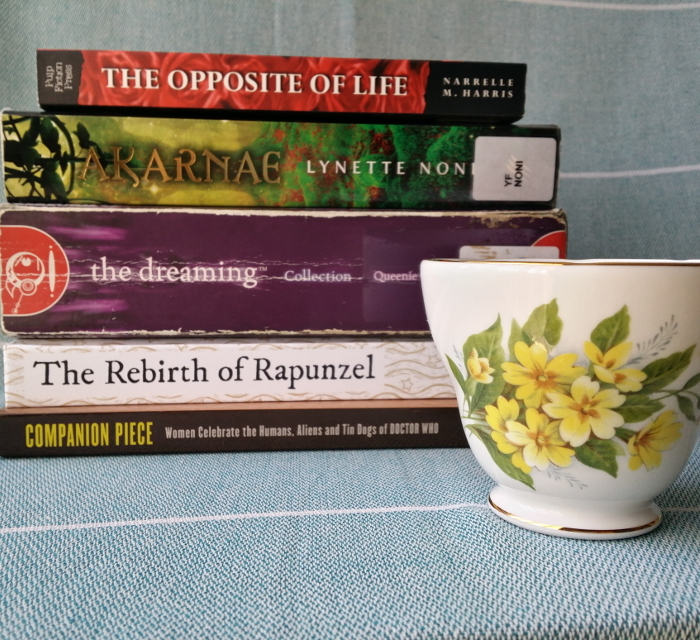 Happy reading in April! I read The Dreaming a few years ago from the library and really liked it! I was reading her new graphic series on Scribd but I guess they aren’t carrying it any more… It is coming out in small collections so I will see if they do a collected edition eventually! The Dreaming was certainly creepier than I usually read, but I enjoyed it quite a bit. Is it Fabled Kingdoms you were reading on Scribd?